Exchange Mailbox Features refers to several features of Exchange mailboxes on your network that are controlled via the Mailbox Features tab of the mailbox User Mailbox page. You may need to enable certain features as you manage your network. 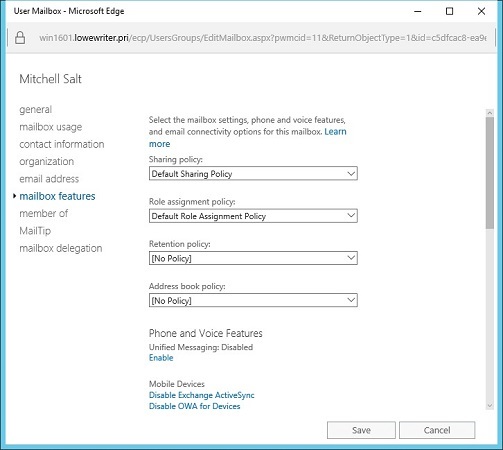 Outlook Web App: Lets the user access her Exchange mailbox from a web browser rather than from an Outlook client. With this feature enabled, the user can read email from any computer that has an Internet connection. This feature used to be called Outlook Web Access. Exchange ActiveSync: Activates the ActiveSync feature, which allows Exchange data to synchronize with mobile devices, such as iPhones or Windows Mobile phones. MAPI: Enables email using the MAPI protocol. POP3: Enables email using the POP3 protocol. IMAP4: Enables email using the IMAP4 protocol. Archiving: Enables the Exchange Archive feature, which is available only with the Enterprise edition of Exchange. Mail Flow: Lets you set delivery options such as creating an automatic forwarder. Message Size Restrictions: Lets you set the maximum size of incoming or outgoing messages.